Anise is a favorite Italian flavoring, especially for cookies. The rich almost bitter taste is so memorable for people. 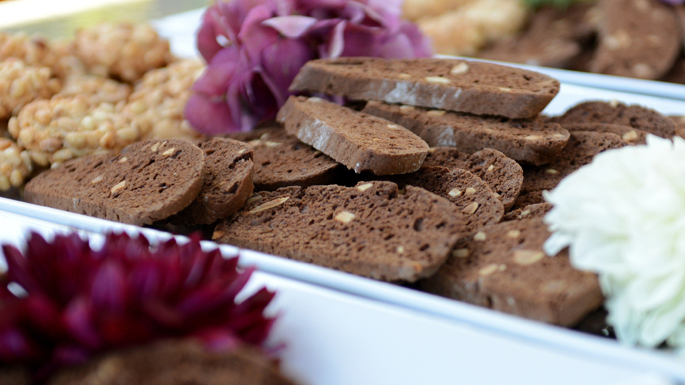 And mixed with some rich chocolate and the crunch of the biscotti, these are just irresistible. Serve these with a really good espresso coffee and some anisette liqueur, and your guests will be transported straight to Italy. Line a baking sheet with parchment paper. On another piece of parchment, sift together the flour, cocoa, baking powder, baking soda, aniseed, and salt. In a mixer fitted with the paddle attachment, beat the butter and sugar until smooth. Add the eggs and yolk at medium speed, one at a time, beating well to combine the mixture. Beat in the anise extract or sambuca and the orange zest. Add the dry ingredients, and mix to form a smooth dough. Add the almonds, and mix just to combine. Bake until the logs are puffed and cooked through but not colored, about 25 minutes. Remove from the oven, and carefully place the logs on a cooling rack. Decrease the oven temperature to 325 degrees. Let the logs cool until you can handle them but they are still soft, about 10 minutes. With a serrated knife, cut the logs on a slight bias into ½-inch-thick biscotti. Arrange these on the baking sheet so they aren’t touching, and bake them until crisp on the top, about 10 minutes. Flip the biscotti and bake until the other side is crisp, about 10 to 15 minutes more. Cool them completely on baking racks.